THE LEAGUE SCIENCE MINISTRY is quite concerned about a sudden infestation of Kana by a previously unidentified species of insect that is clearly a transplant from off-world. The insect in question, dubbed “Parafly” by Ministry entomologists is quickly becoming present in all quarters of Kana. Its entomology is baffling, as it exhibits traits of many dissimilar types of insect. Its body resembles that of a common dragonfly, though it is many times larger and heavier. It has a single pair of swept-back wings, like a wasp, though some early reports stated it has a second pair of wings. It also tends to move about in great, cloud-like swarms like a bee. By all accounts, the Parafly is a very pleasing insect to look at, with a metallic blue and green body with striking coppery wings. Their wings are extremely shiny and mirror-like in their reflectiveness. It also has a great tolerance for wide variations in climate and temperature as it thrives all over Kana from the temperate south to the frigid north. Word is spreading that Paraflies carry an enormous stinger and a cocktail of poisons making it one of the most poisonous creatures on Kana, though dissections of southern specimens revealed no stinger. The Paraflies temperament has been described in a number of different ways, from docile and patient to extremely aggressive and rather locust-like in their tendency to swarm, creating a deafening buzzing sound as they do. 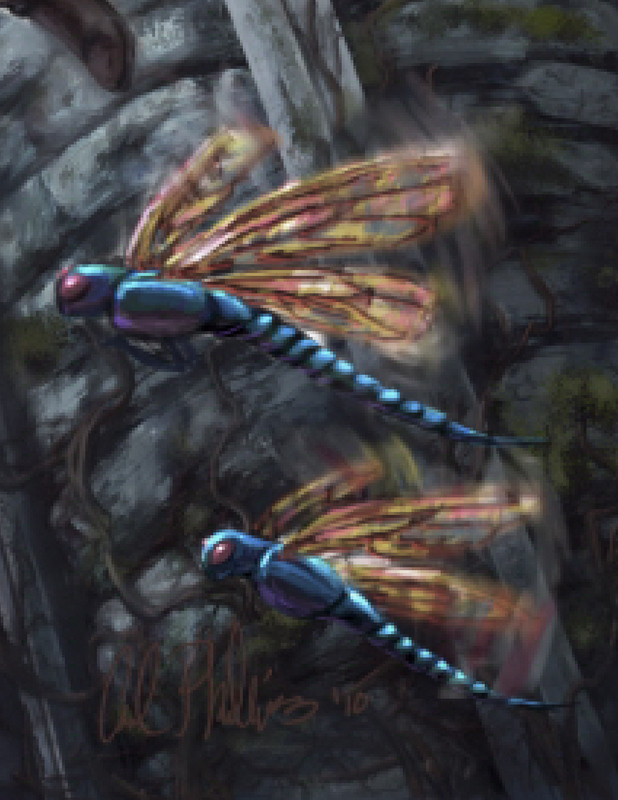 A number of reports have come to light by Kanan citizens claiming to have been chased by swarms of Paraflies. Others report Paraflies swarm into people’s homes, make a terrible racket, and then exit just as quickly. 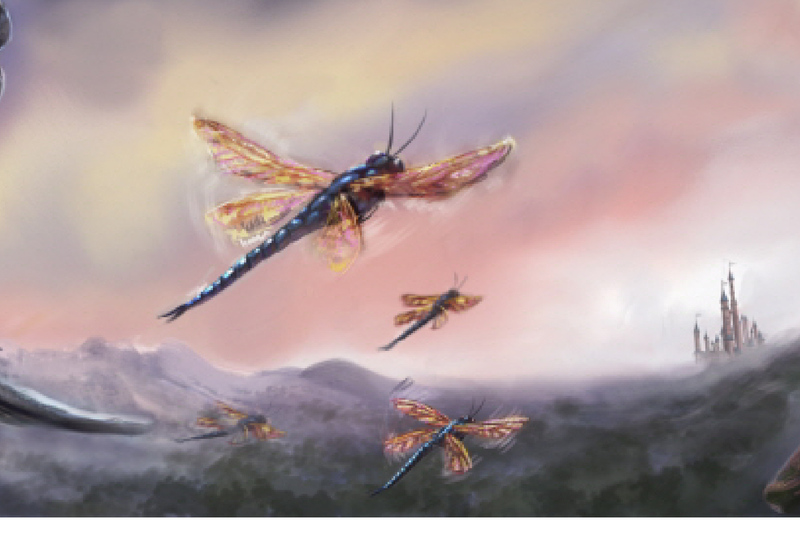 Clearly not native to Kana, the Parafly is assumed to be a transplant from another League world, possibly a stowaway from Onaris or Bazz, two places known for their exotic and rather large insect life. However, the Parafly does not resemble any known species of insect from either of those two worlds. A rumor in Zenon has cropped up regarding Paraflies and ghosts, that they are attracted by the presence of ghosts. The Jones temple of Bazz, accustomed to dealing with large insects, believe the Parafly is an engineered creature, or purpose bred. If true, the person or persons responsible for breeding them and why is not known. I can’t wait to get the series started already. Paraflies are fairly important to the story and I’m eager to see what you think of them (the pics are blow ups of the cover).